Killer Characters: Dripping in Diamonds? Kidnap Latte? Killer Latte? Hhmmm...Welcome to the Bean Hive Coffeehouse! Dripping in Diamonds? Kidnap Latte? Killer Latte? Hhmmm...Welcome to the Bean Hive Coffeehouse! Hi-do! Welcome to The Bean Hive. I'm Bunny Bowowski. You can grab a regular coffee from the coffee bar or a tea. But you look like you want one of them fancy drinks like a latte, or one of them caramel macchiato. You know, they are filled with sugar. Don't take my word for it. I'm just an employee that's making those Killer Lattes, ummm, Star Studded Lattes since Lemon Productions is here filming a movie. But I bet you're here to check out all the noise about the #killerlatte. I mean, really. Just because that Hollywood actress, Daisy Lemon, came in here to get a Star Studded Latte but was kidnapped in the process, doesn't make it a #killerlatte. But you'd have to ask Roxanne Bloom, Roxy if you know her, about any sort of particulars. She was the one who seen Daisy last. I probably shouldn't tell you this, but she's asked me to look after the coffee house while she headed down to the police station. Mmmhmmm. Now I did hear the ransom note was accompanied by a photo of Daisy. She was dripping in diamonds. And not just any diamonds. All the diamond jewels used in the movie. I bet that's got to be heavy around her neck. I heard Low-retta Bebe. . .huh? Oh! You don't know Loretta. We call her Low-retta because when she says her name, her southern accent, well, you know what I mean. Anyways, Low-retta owns Diamond's downtown and she offered all her jewels for the production company to use while they were filming. Daisy Lemon had all them on. Ain't that strange? Oh no...the police didn't leak the photo. Maxine Bloom did. She's got her sneaky ways to getting things. 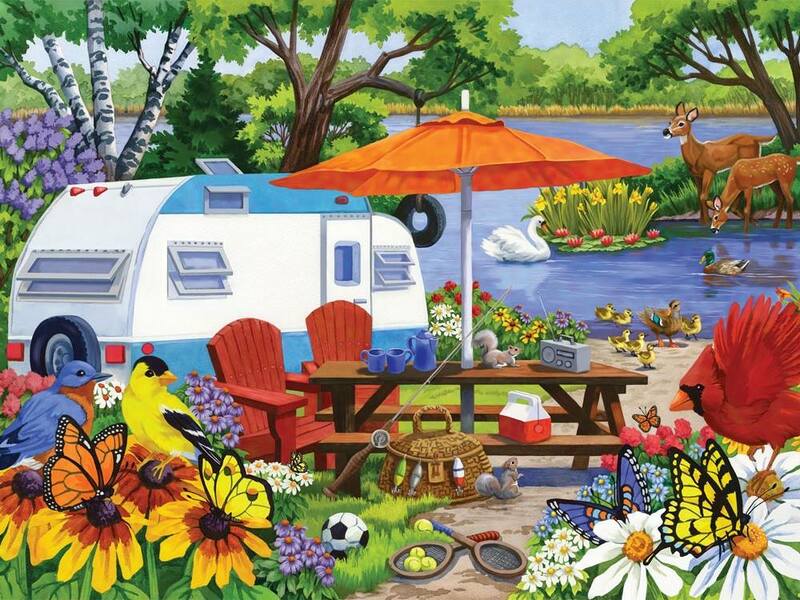 She write Sticky Situation, the gossip column in the Honey Springs Newspaper. But claims she'd doing a piece for People and she got her hands on the kidnapper photo. Now that's just hearsay because I ain't seen the photo. I've rattled on enough. You enjoy your Killer Latte, I mean. . .you know what I mean. Y'all come on back. Remember that around these parts, the gossip is just as hot as the coffee. Toodles! Readers: Do you like recipes in your cozies? Do you ever make the recipes? 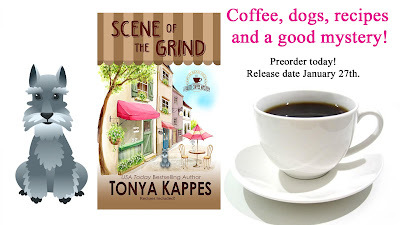 Leave a comment for a chance to win one of the IT'S A SOUTHERN MYSTERY, Y'ALL measuring spoon and Kappes mini-tote and A KILLER LATTE EBOOK ARC!!! Winner will be announced on MONDAY! 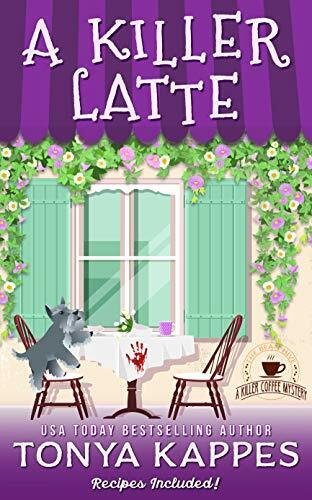 Don't forget to add A KILLER LATTEE to your Southern Mystery Shelf on Goodreads. I'd greatly appreciate it. Click here to add to your Goodreads. If you were to come by The Bean Hive, you could eat one of these amazing gluten free mini-cheese cakes. 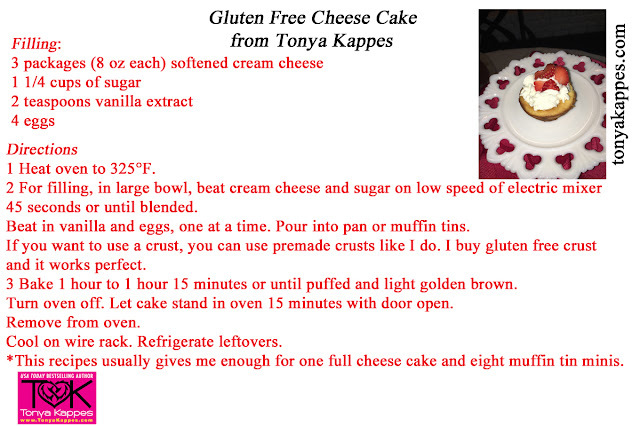 Or grab the recipe and many more southern recipes at Tonyakappes.com under the Secrets & Alibis tab. Do you want to be in a THE PRIVATE COZY KREW CLUB??? We have so much fun! We talk about life, friendship, recipes, and BOOKS! Please a few member only giveaways. Be sure to follow the link HERE! There are so many ways to be involved and connect with Tonya! Love see recipes for featured dishes in books. Haven't try yet. On I love your work Tonya! Long time reader and would love to win this and bake your recipes! Recipes are always fun in a book. You never know what great ones you'll discover. Thanks for the chance to win! I love this series!!!!! mcastor07(at)gmail(dot)com. I love recipes in cozies. I always have good intentions to make some of the recipes, but I never have. Maybe one day I will. I often use recipes from books. It can be part of the fun. I love recipes in books. I think it makes the people in the book seem just like us. I have tried some of the easier recipes. I love recipes in books! I have made a few, but I hope to make more! I LOVE THE RECIPES! I JUST SAW THE PEANUT BUTTER COOKIE RECIPE AND BOY THEY SOUND GOOD! I love recipes in books! Never made any, but I love your books. I love the recipes and intent on trying some when I am on vacation. I love the Bee Hive Coffeehouse mystery series. I love recipes in books and have tried a few. Thanks so much for the chance. I love recipes in books. I have made a couple of ones from books. Thanks for the chance. I love recipes in books. If they are good, I keep them in my recipe collection. I really enjoy this series. Well, I love all your series!